During my vacation in Shanghai, China, one of my friends living in Hangzhou invited my husband and me to spend a weekend with his family there. It has been over 10 years since my last trip to this city. Hangzhou is the capital city of Zhejiang Province in eastern China, approximately 120 miles away from Shanghai. It is one of the top tourism cities in China because of its rich history and stunning scenery. A common Chinese saying about Hangzhou is “Paradise above, Suzhou and Hangzhou below”. Over the past 10 years, Hangzhou has become a technology hub in China. You may not be familiar with the name of the city or have no idea where it is located on the world map, but you must’ve heard of Alibaba. Hangzhou is the home to China’s most famous eCommerce company. The rapid growth of mobile technology has been changing Chinese people’s daily life. Besides the joy of reuniting with a friend, this return visit was full of surprises of just how integrated mobile technology is on a day-to-day basis. 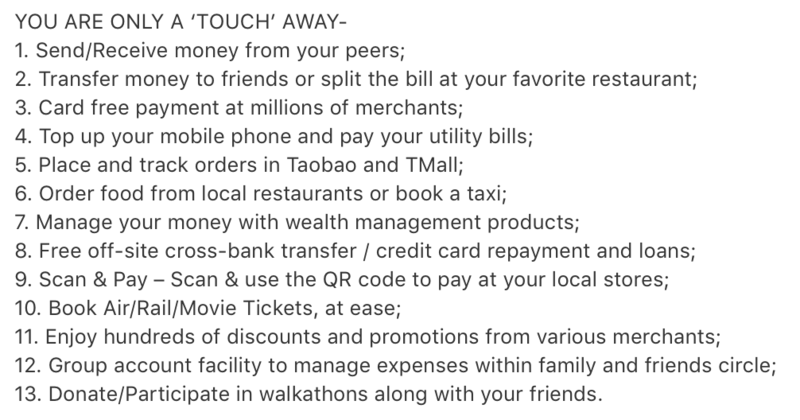 If you have never been to China or haven’t visited China in years, the first thing I would encourage you to do is to download the Alipay app. You can find the app (English version) on either Apple’s App Store or Google Play Store. You might initially think of Alipay as a Chinese version of Paypal; however, it is a much more comprehensive app that brings convenience to the daily lives of people in China. I can’t express how amazed I was by using this app; and yes, their slogan “Make life easy” truly speaks to the heart of my trip in China. Although I am a big fan of Harry Potter and would love to use a portkey, we need to be realistic. Since Hangzhou is only 120 miles away from Shanghai, there are typically four ways to get there: train, bus, taxi, or rental car. I highly recommend you take a train because it is the cheapest and most comfortable way to travel from Shanghai to Hangzhou. That way you don’t need to worried about the language barrier, international driver’s license, or local traffic regulations. 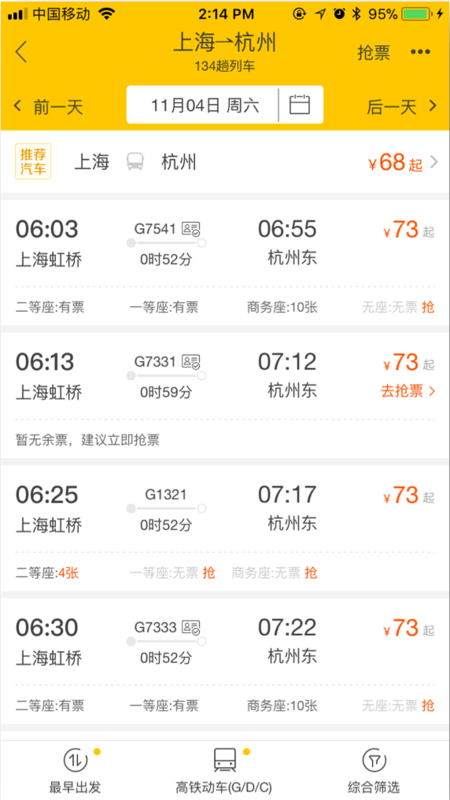 You can easily purchase a train ticket from Fliggy, another travel app developed by Alibaba. 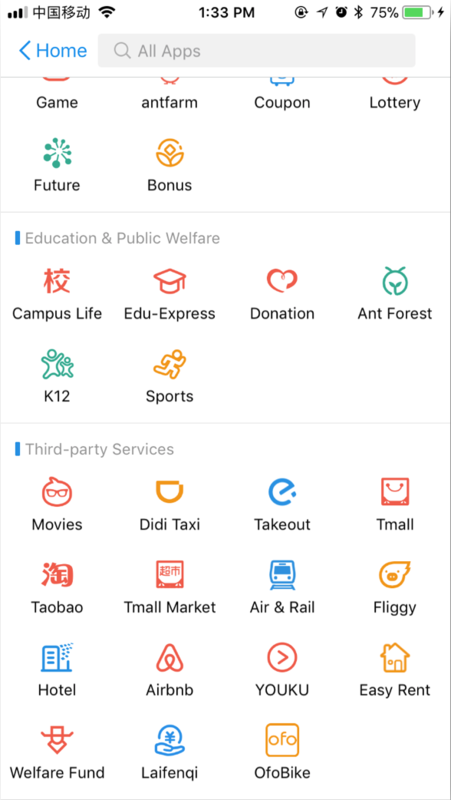 If you have already downloaded the Alipay app, you can access Fliggy through Alipay. Unfortunately, the Fliggy app doesn’t have an English version. Alternatively, you can use another travel app called “Trip.com by Ctrip” or visit ctrip.com to purchase a ticket with your passport and print the ticket at the ticket vending machines at the train station. Here’s another reason I recommend you take the train, especially the high-speed train: China’s high-speed rail (HSR) is the world’s longest and most extensively used HSR network with speeds up to 217 mph (350 km/h). The ticket price (one-way) for Shanghai to Hangzhou is only USD $11 for 2nd Class, USD $18 for 1st Class, and USD $34 for Business Class. (See the table below comparing the cost of an Amtrak ticket from Ann Arbor to Chicago.) You will also get a complimentary bottle of lemonade and a snack bag. Enjoy! When you are waiting in line to enter the gate, you may notice that some of the Chinese passengers scan their Resident ID card to enter the gate without a ticket. The second-generation ID cards in China contain a non-contact IC chip card. Unlike your social security card or driver’s license in US, the Chinese Resident ID stores name, gender, DOB, photo, address, religion, ethnicity, police record, medical insurance status, educational background, work history, fingerprints, and more. Starting in 2016, a few train stations also started to use face-recognition gates. These gates allow users get through the gate within 3 seconds by stacking their train ticket and ID card and scanning their face with a camera. There are similar face recognition gates at some major Chinese airport customs or boarding gates where Chinese residents can quickly scan their face and passport or flight boarding pass to verify their identity. In response to the number of terrorist attacks worldwide, China has been increasingly integrating new face recognition technology for security purposes in the country’s infrastructure development projects. 3.Mobile payment in public transportation: No change? No worries! One-hour on the rail goes by fast and you’re at your destination before you know it. 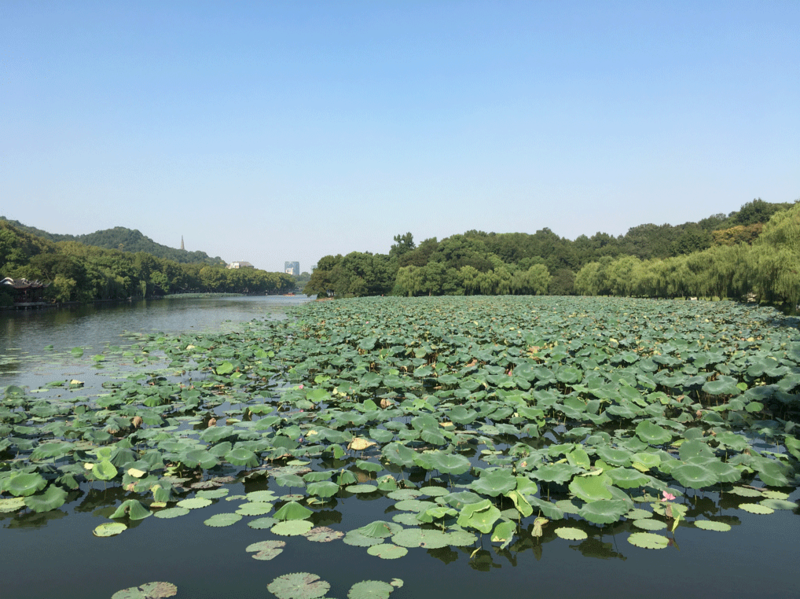 Are you ready to explore Hangzhou’s stunning scenery? Hangzhou’s public transportation network is well-developed to welcome millions of domestic and international tourists every year. To get around, you can take buses, subways, taxis, bikes, or travel by foot if you like jogging. After using the Gaode Maps (a map app similar to Google Map) to check different routes, we decided to take the bus for sightseeing. 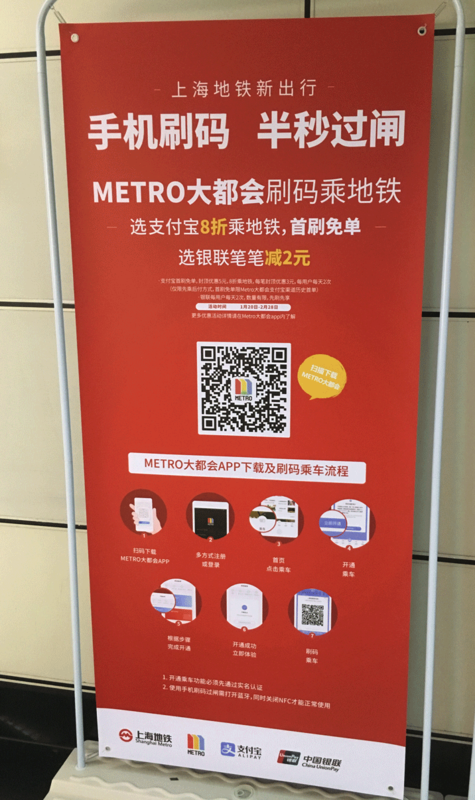 Here came the first big surprise of how well-accepted mobile payments are in China: after we arrived at the bus station, we noticed that the bus ticket is 2 Yuan per person or you can use Hangzhou Metro card. Since we didn’t have a Metro card, we started to search our backpacks and try to find some change. No luck. A QR code on the bus station board caught my attention. It says you can use your Alipay app and apply for a digital bus pass. Woohoo! We found the City Service in Alipay and applied for a bus pass in seconds. It generates a unique QR code for us to scan and pay for the bus tickets. It also works offline in case you don’t have a stable internet connection. Alipay also has a feature called Credit Pay, which allows you scan the QR code and pay later. When the bus came, we followed other passengers, pulled out our phones, faced the QR code to the scanning machine, and paid for the ticket via Alipay. It was so fast and delightful! I no longer need to worry about keeping change in my bag or losing them mysteriously during the trip. The thoughtful offline and Credit Pay features help passengers get out of awkward no-internet-access or out-of-cash situations. Bye-bye, coins. Purchasing a subway ticket is a little different. You can still buy a ticket through Alipay and find a ticket vending machine at the subway station, where the machine will scan the QR code and dispense a subway ticket. However, starting Q4 2017, subway stations in Beijing, Shanghai, Wuhan have newly developed gates that allow passengers to scan the QR code directly at the gate and immediately enter. 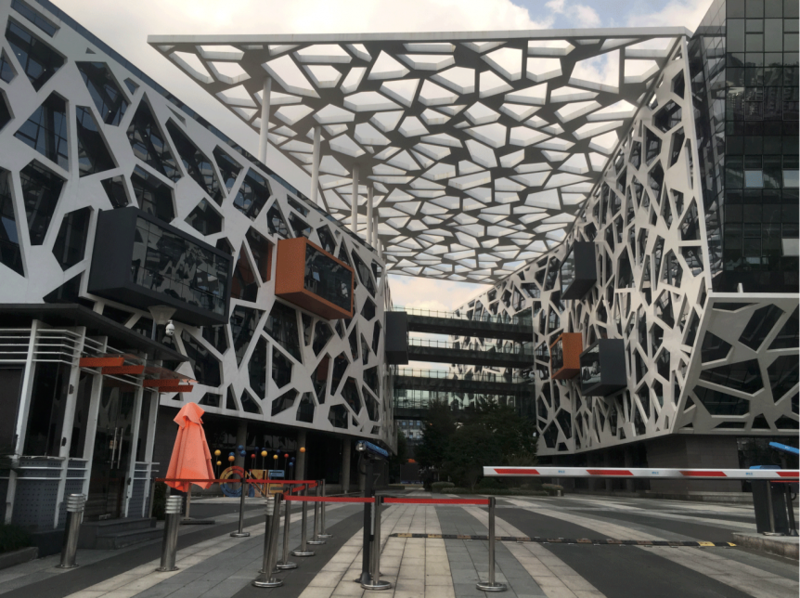 More excitingly, Alipay also recently started a new program with Shanghai Metro to incorporate Alibaba’s face-recognition technology. 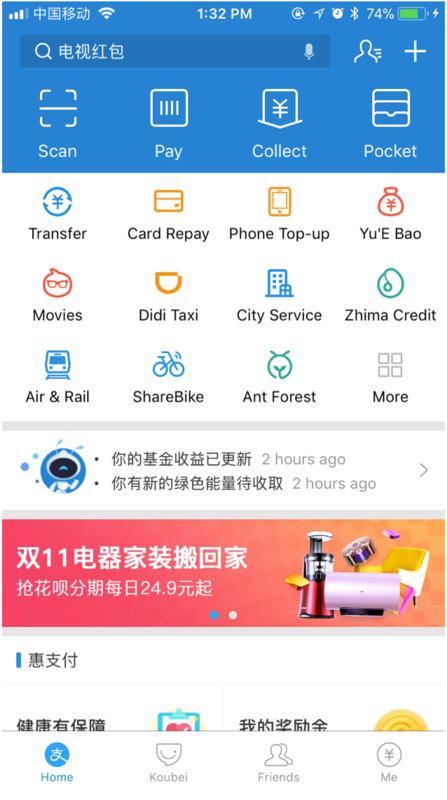 If you are too lazy to figure out which bus or subway line you should take, you can also use Alipay to connect to the 3rd party taxi app, DiDi. DiDi is the Chinese version of Uber. Once you log into your Alipay account, the SSO (single sign-on) feature allows you request a ride and pay with Alipay without installing DiDi’s own app. Mobile Payments in China: No Wallet, Bring Your Smartphone: Part 2 – KFC’s healthy restaurant pairing up with Alibaba’s Smile to Pay technology, and reasons behind the booming mCommerce and IoT development in China.